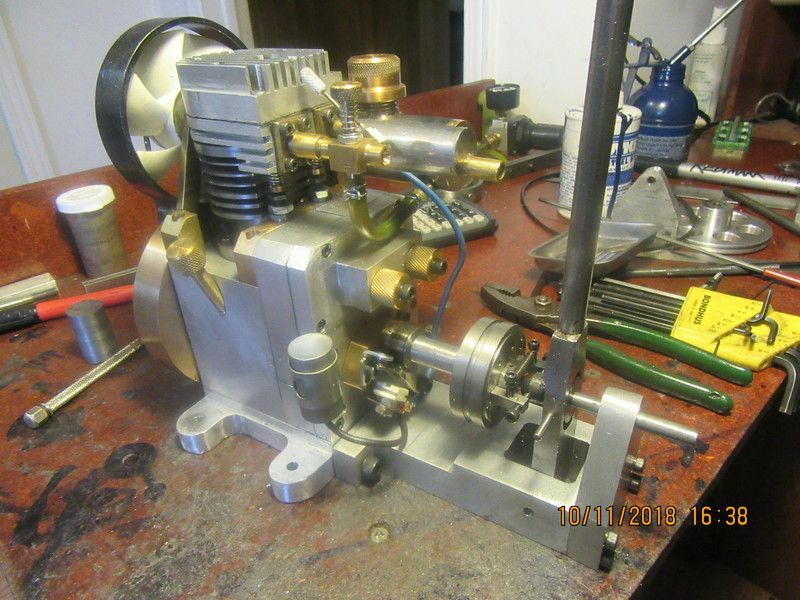 A few years ago I had my single cylinder flathead i.c. engine featured in Home Shop Machinist magazine. It was built by a number of people, and since then has mostly set on a shelf in my office collecting dust. 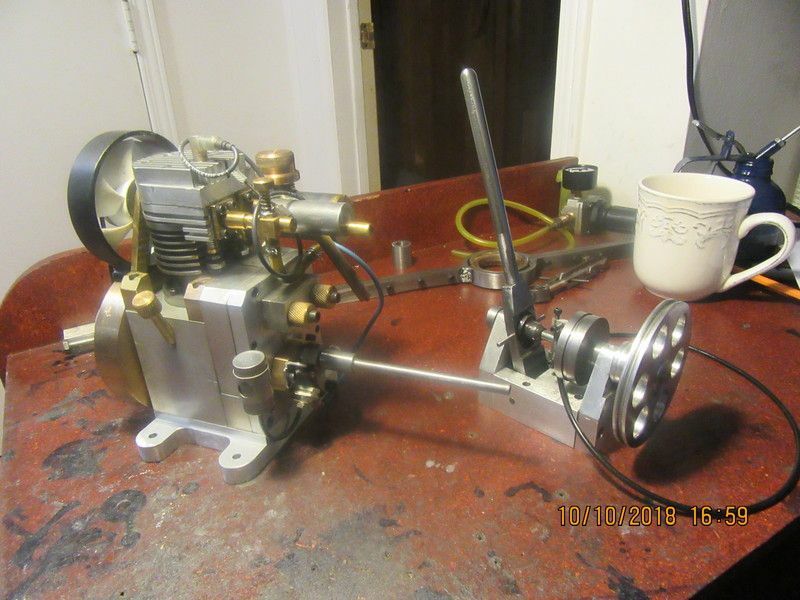 I have been messing around with various styles of manual clutch this last month or so, and have decided to install a manual clutch on the flathead engine. I designed a "line shaft clutch" last year, and in it's final guise as an expanding shoe clutch it worked so well that it has become my favourite style of clutch. 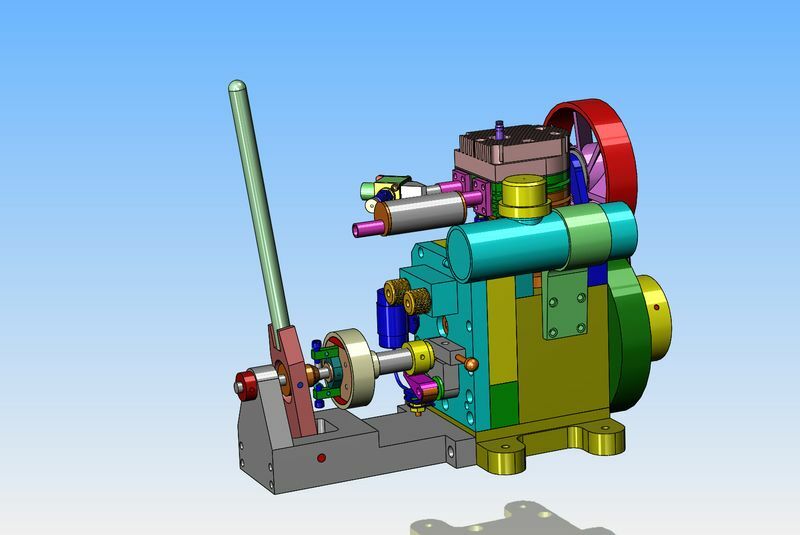 I am going to modify the clutch and make it a direct drive from the crankshaft of the engine. 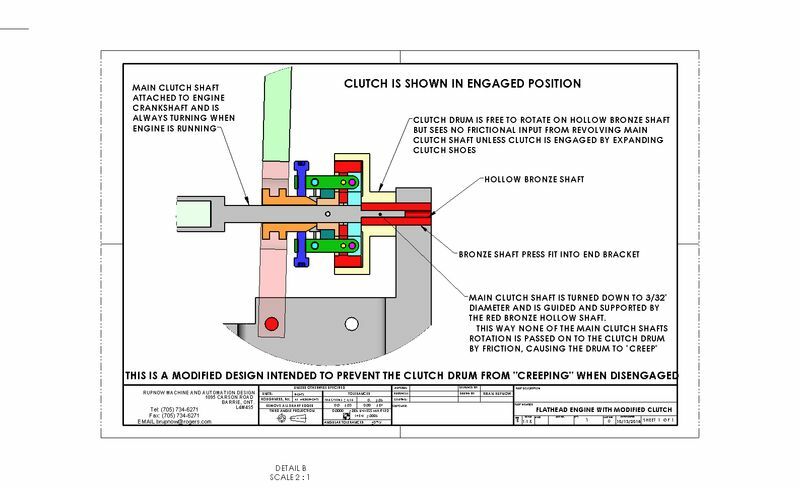 Neat looking drawing and the clutch should be a good attachment to your motor. Hot diggity dog--I made a part today. In fact, I liked it so much that I made it twice. That long extension hanging out of the engine started life as a piece of 1/2" cold rolled, turned to .25" diameter over most of it's length with a 3/8" counterbore in the 1/2" end to slip over the engine crankshaft. Somehow, I managed to read my micrometer wrong and turned the first one to 0.22" diameter. Ah Poop!!! So, into the box of miscellaneous short ends it went, and then got remade. In the picture, you see all the victims. The flathead engine, the line-shaft expanding shoe clutch, and the single part that was successfully made. So here we are at about 85 percent--Everything goes round and round with no binding and no clearance problems. I have to trim the clutch shaft to length and drill a hole thru the shaft for a dowel which locks the expanding shoe carrier to the shaft. Also have to drill and tap two places at the sleeve end of the shaft to lock it to the crankshaft. Next step is to clean up the drawings tonight and send them off to someone. So, today we have a video of the clutch in operation. I would call this clutch about 85% effective. The fact that the clutch drum rotates freely on the driven shaft and only revolves under power when the clutch is engaged means that the clutch wants to "creep" a little even when it is fully disengaged. Of course the trick is to find something to drive which has enough resistance to keep the clutch from "creeping" but not so much resistance that it stalls the engine when the clutch is fully engaged. I already have an idea in the back of my head on how to build a "non creep" clutch, and will probably post about it when time allows. The people who bought plans for this clutch will get new free plans for the new "non creep" version after I have built and tested it. The last 20 seconds shows me de-mounting the camera and tripod--I thought the camera was turned off. As you seen in the previous video, the clutch performed quite well, but had a tendency to want to "creep" even though the clutch was fully disengaged. This was caused by friction between the rotating clutch shaft and the clutch drum which was supported by it. 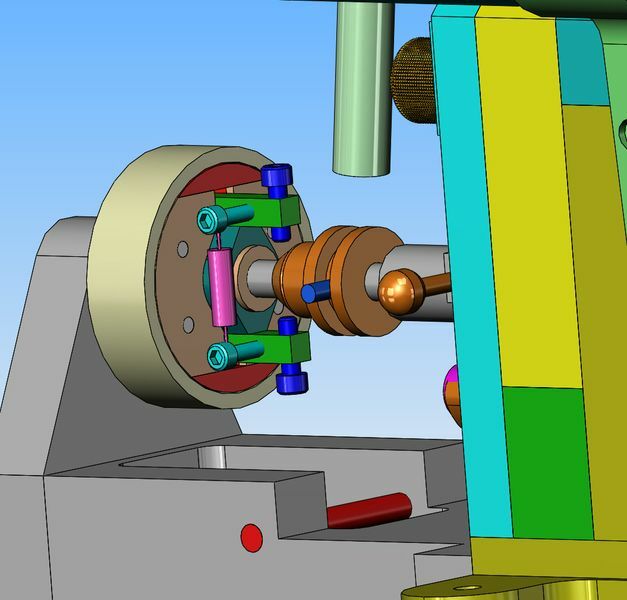 I have a new design using almost all of the current parts, but arranged a bit differently so that the clutch drum will never see any frictional influence from the rotating clutch shaft. Interesting design Brain! Do you have an section view of the previous clutch system? This shows what the previous clutch (this morning) looked like in cross section. 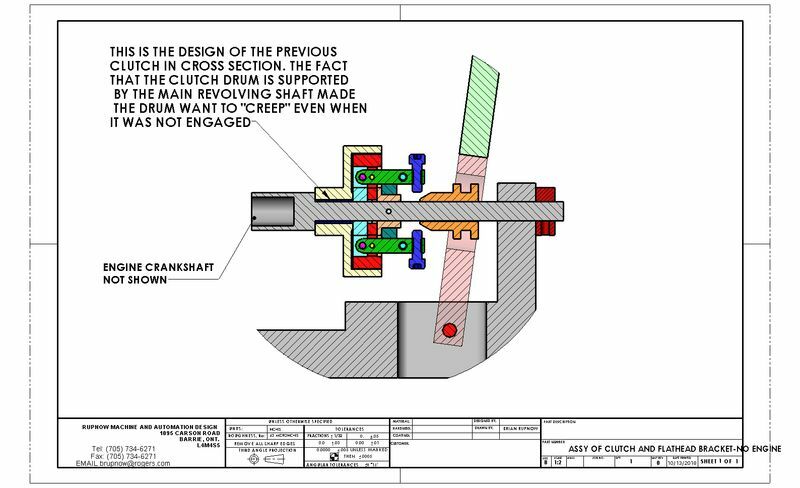 The fact that the clutch drum was supported by the rotating shaft made it want to "creep" even when not engaged. I am busy right now with a drop in design order for a welding fixture for a General Motors supplier. As soon as I get the chance I am going to put another spring on the opposite side to the current one and see if that cleans up the problem of "shoe drag". Hi Brian, another interesting build that I have been following from the beginning. To reduce the centrifugal force due to the cap screws, it might be worth trying replacing the cap screws with grub screws. I don't know if it would be enough, but easily tried. At least the extra spring should work, though of course it will also increase the centrifugal force required to force the shoes outwards to press on the drum, so again hard to tell. Again easier to try than calculate. Can the levers be drilled or milled with channels to take out more weight from them?